An optocoupler (aka photocoupler or opto-isolator) is an electronic component used to transfer a signal between different parts of a circuit which need to be electrically isolated from one another – for example, where a high voltage or high current is to be switched with a low voltage low current signal. Typically in such situations a relay is used, however these can be quite power hungry, prone to failure since they contain mechanical moving parts, and a relay is physically very large relative to the other components on a typical circuit board. 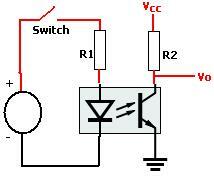 An optocoupler uses light to transmit a signal and so two parts of a circuit can be electrically isolated from one another but still able to pass across signals. The image above shows a typical optocoupler – note that it is housed in a chip form and is therefore small and easy to mount on a circuit board. The schematics above depict the operation of an optocoupler. The left hand image shows the switch between pins 4 and 5 on the chip is open since the LED is not lit. The right hand image shows that switch now closed when the LED is lit. Pins 1 and 2 connect into one circuit, and pins 4 and 5 connect into a second independent circuit (electrically isolated) from the first. Note that the LED and light detector (photo-transistor) switch are completely enclosed within the small optocoupler chip. Above is an example of how an optocoupler connects the two isolated parts of a circuit – in this case acting as a logic NOT gate. When the switch is closed, the LED in the optocoupler lights up and that light is detected by the phototransistor in the optocoupler. This pulls the output pin low – i.e. Vo is connected to ground via the phototransistor. When the switch is instead left open, Vo is instead connected to Vcc and so the output is high. Note the essential resistors R1 and R2 which are used to limit the current passing through the LED and the phototransistor. 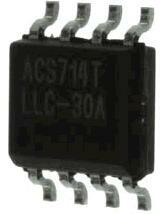 A good selection of optocouplers are available here: buy Photocouplers, and here: buy Optocouplers.